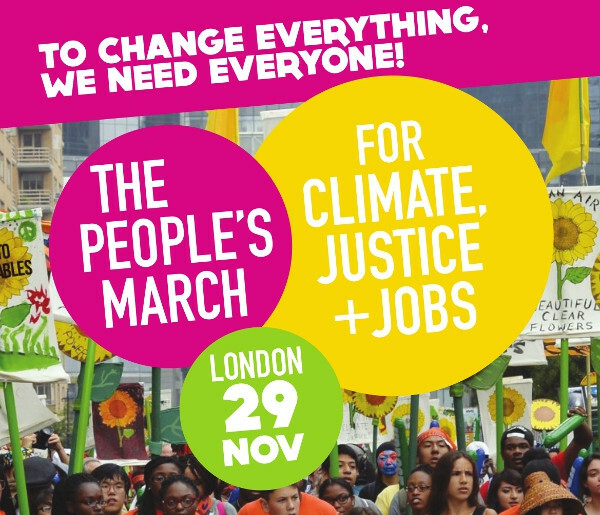 Join us on the Peoples March for Climate, Justice & Jobs and together with TCE & others Collaborate for a Low Carbon Future! 1st August 12-6pm *Haringey@50 Celebration* Bruce Castle Park, N17 Dance, Music, Stories and Attractions. 8th August 11am – 3pm * ‘Meadow’ Puppet Theatre Production * Regular performances from ‘Old Saw’ company in our Meadow Orchard (accessed at the bottom of the car park behind Hornsey Health Centre, 151 Park Rd, N8 ). Suitable for 3-8year olds and their grown ups. “ Magic realist Folk Pop” reviews Q Magazine. Free, recommended donation £3. 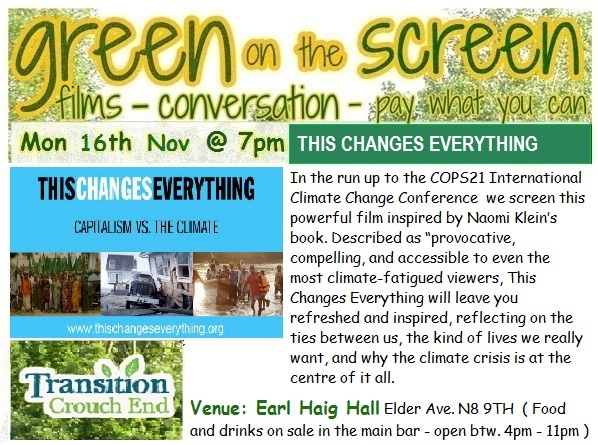 30th Sept * Green on the Screen ‘ Another World’ * Hornsey Town Hall. A topical film about grassroots initiatives in Greece. What can we learn and harvest here in the uk about the Greek crisis that will best not cost the Earth? Knowing that what we reap is what we sow – What can and is happening here to prevent us disasterously 'fuel' ing the global economy? To open up energy transition rather than block it? – Come join us and be a positive force for change...Evening, time tbc. 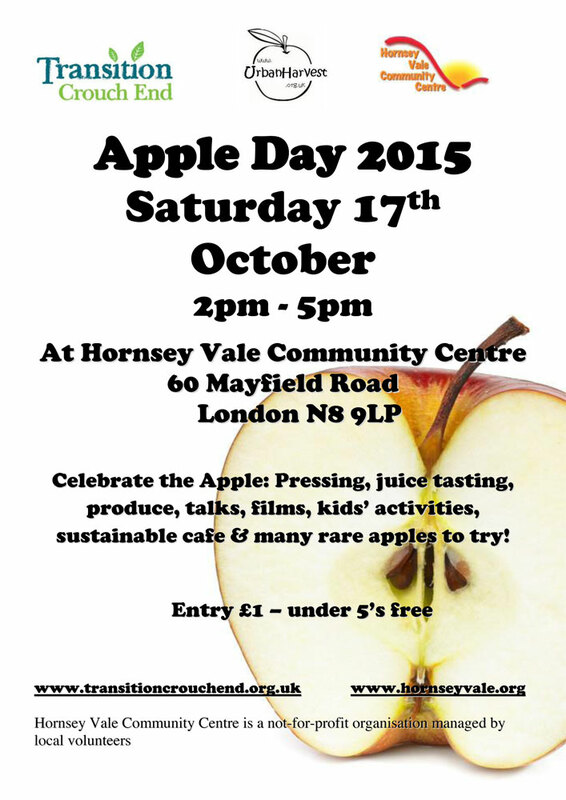 17th October *Apple Day* Hornsey Vale Community Association. *Haringey Climate Change & Divest News *. TCE in partnership with other environmental groups and individuals in our community want to ensure that the government plays a constructive role at the UN climate summit in Paris in December. We will have a stall at a number of the above summer events so look out for us. In addition we will be collecting signatures for a Divest petition (urging Haringey Council to divest from any businesses involved in exploration or production of coal and tar sands). This is part of a global movement which has been supported by Norway's sovereign wealth fund, Oxford City Council, Glasgow University, Stanford University, and many others. Please sign it and ask all your members, friends and relations to do so. Anyone 18 or over who lives, studies or works in the borough of Haringey can sign. If you would like a speaker to take part in a discussion with your organisation, we can provide one. 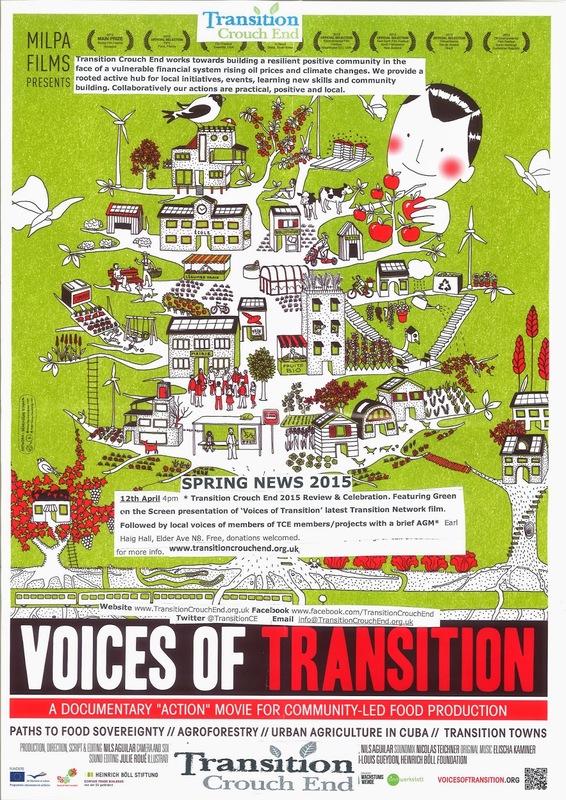 Transition Crouch End news & events are announced 'live' at Green on the Screen nights. Food & drink will be available for purchase in the main bar. The grassroots documentary on land rights, explores activism and protest in Austerity Britain. The Guardian reviewed it as "A powerful film" and asked..
"Is something deeply wrong with our conventional democracy, when it simply cannot tolerate grassroots efforts to create self-reliant alternatives? Alternatives that oppose the state's and corporations' ill-conceived decisions to doom us all to environmental catastrophe?" There is a crucial national Climate Coalition lobby of Parliament on Weds 17th June. We aim to have a large number of our community coming along to insist that the government plays a constructive role at the UN climate summit in Paris in December, to put pressure on the biggest nations to cut their emissions. Our jointly held Climate Change Hustings was very well attended, now local environmental campaigners and groups invite you to join us on 1st June to discuss and share our collective positive strategies around Climate Change and the 17th June lobby and our future..
We begin by visiting our Ktchen Tyre Garden at Hornsey Vale Community Centre, Mayfield Rd N8 and hear about the 'Story of Oil'. We then move on to the Meadow Orchard Project and finish at the Priory Common Orchard for a shared 'Big Lunch' in this urban forest garden at 1pm. Free 'pick your own' salads to harvest and music from our fabulous accoustic singer and musician, Stacey Cohen. Hear about his experiences living in the wilderness with 40 strangers with no technology as off grid and no contact with 'civilisation'. 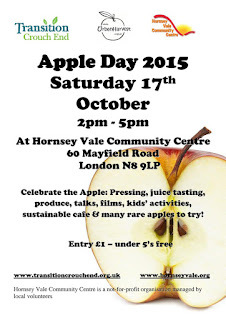 Meadow Orchard is behind the Hornsey Health Centre car Park, 151 Park Rd, N8. 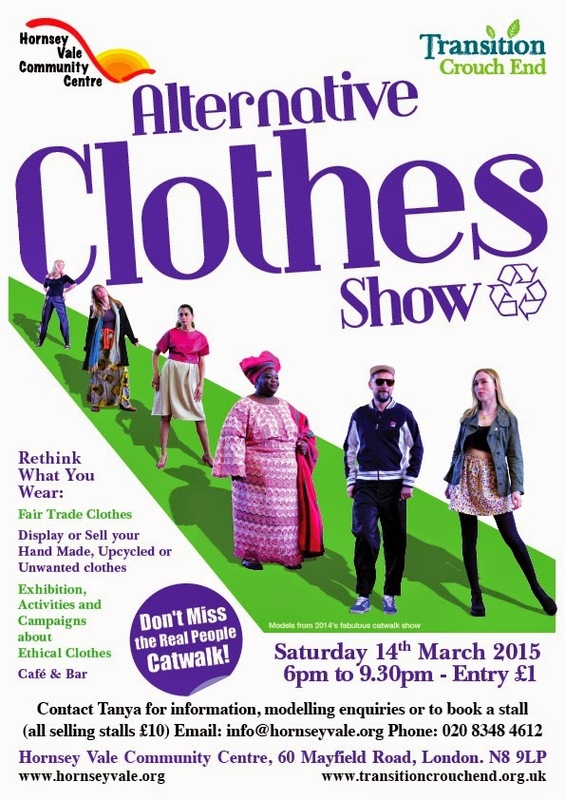 Entry fee £5-12 sliding scale. Transition Crouch End news & events are announced 'live' at Green on the Screen nights. Find us.. This one day course will look at how natural systems can teach us how to garden sustainably and abundantly, and nourish our own health and vitality. We will learn some of the guiding principles of permaculture and natural medicine and explore in practice, their applications, working in a beautiful orchard, and making plant remedies to take home. An overview of conventional and permaculture gardening & conventional and natural medicine. The ecology of the garden and our body. Natural approaches revitalising our health and our gardens. Perennial Polyculture, seasonal food growing, garden medicinal herbs, and medicinal ‘weeds’. Practical sessions in the garden, and preparation of plant medicines. This day mid week course will be led by Jo Barker and Claire White, both experienced & passionate Forest Garden Designers and teachers who have worked on various projects, ranging from Farm scale design and implementation, community projects and home gardens. Examples of their designs will be available on the course. • Origins & principles of forest gardening. • Design with trees, shrubs and ground cover. • Implementation of design and aftercare. This course is open to all, no previous experience is necessary to attend, forest gardening attracts interest from experienced gardeners and professionals as well as newcomers. There will be practical sessions (mulching) and design exercises. We will be outdoors for much of the course and might be visiting other sites, if you have a disability that you think may affect your ability to attend the course, please contact us before booking to discuss how you can be accommodated. 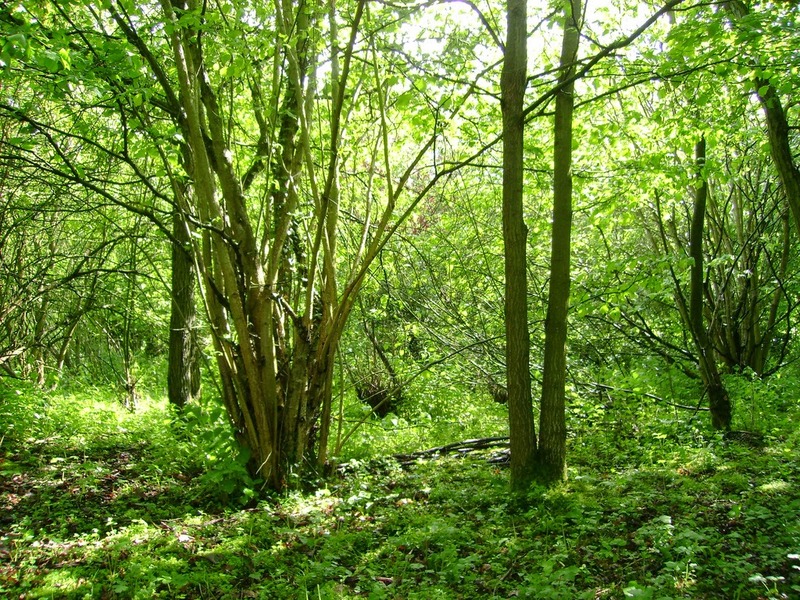 By the end of the course you will have a basic knowledge of the ideas and principles of forest gardening as well as understanding some of the techniques necessary to put the theory into practice.